Please refer to our stock # 8088 when inquiring. Born in Newtonville, Massachusetts, O’Brien exhibited a love of drawing and painting from a very early age. As a high school student, he took all possible elective courses in art and technical drawing. He supplemented this study with evening courses at M.I.T. Following his move to Washington, DC as a young man, he enrolled in the Washington Workshop of the Arts. WWA, like the Art Students League in New York City, was a school in which all the classes were taught by a rotating roster of professional artists. During WW II, his technical artistic training served his country well when he was put to work as a map maker. In the final year of the war, O’Brien married. On his honeymoon in New York City, he found time to paint the rooftop view from his hotel room window. 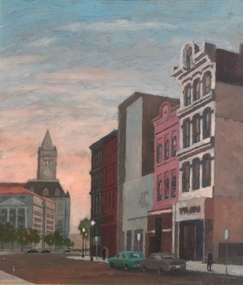 This initiated a lifelong pursuit of city painting (his family was inclined to call it an obsession). Starting with the founding of Federal Graphics, a commercial art firm he launched with a partner in 1947, he pursued a commercial career for the majority of his life. However, he always considered painting his “real” work, and his dedication to this vocation was apparent in a myriad of ways. He helped to found the Montgomery County Art Association and held memberships in the Arts Council of Montgomery County and American Art League. Throughout his life, he exhibited widely, both as an individual and in group shows. The Arts Club of Washington, Corcoran Gallery of Art, Brooklyn Museum of Art, Montgomery College, and the Rehoboth Art League were a few among the many venues at which his works were shown. In addition, he exhibited in several private galleries.